...it's already tomorrow. In that case, yesterday was Mark's birthday. I won't say which one it was, but will say that it was significant. Now he is upstairs, sleeping like a baby, which is one year farther from reality. I must be so far from infancy that I will never sleep...good thing I have dogs to keep me company. Anyways...we decided to celebrate his birthday modestly. After all, it was a mid-decade birthday, no zeros at the end. So, what did we do...we went to the river, of course! One by one, they came...Andy and Kailyn, Tony and Morgan, Vicky, Jamie and JR (oh and of course Max and Chubbs, the dogs). That is the first time I bought one, probably the last...by time we got it served, I was ready to take a nap. Too much work for...ice cream? I can't believe that of the few photos I took, only one was worthy of sharing. I apologize...but I'm sure that before you know it, I'll be back on picture overload. I just wanted to take a second opportunity to wish my dear hubby a very happy birthday and a big, wonderful year ahead. With us, you never know what we'll be doing next, but whatever it is...I love you, Honey! People eating! It must be a family gathering at our house! Grandma must have brought kielbasi and 'kraut! Wonder what's going on? Dan, do you know what's happening here? Is Grandma having heart palpitations? Is what we're looking at...family picture time!!!!! 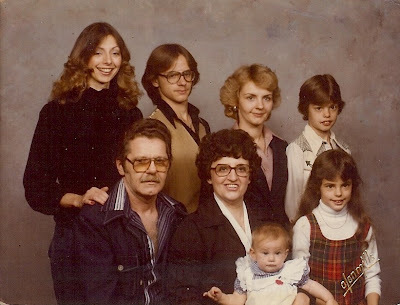 Seriously...even though we have TONS and TONS of photos...THIS^ is that last portrait we had taken...and it was in 1980! Is that a riot? Note: Kristina, our photographer, has the patience of a saint (she worked with our family) and has pretty reasonable rates. She will NOT, however, work for food. We tried, it just doesn't work. If you are looking for a photographer in "OUR AREA" let me know, I can hook you up! Because she's our latest casualty, someone gave Morgan her own parking place! I really can't remember how he got the name Woobie, but it stuck...for a long time. Even now, someone calls him Woobie on occasion! I LOVE it when the family gets together! Pee Ess...Linda and I are packing. We're heading to the river for a few days, roughing it! Oh, to be sure, there is high speed internet there, but only basic cable! 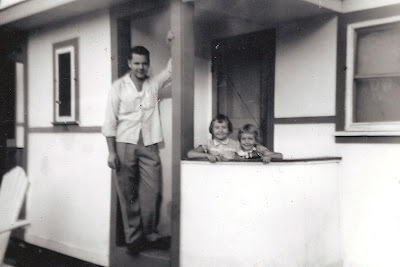 This is my father, me and my sister, 1957, Lake Breeze Motel, Erie, PA.
My father passed away 5 years ago, my sister has been gone for 10, but what memories! Those vacations, less than 100 miles from home that lasted less than a week, felt like month long trips to some exotic port, far, far from home! 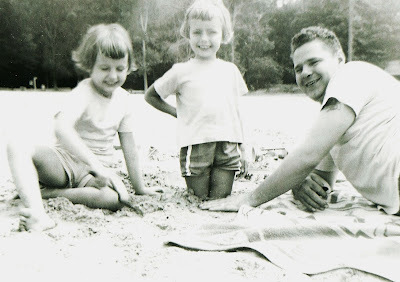 My parents would talk for weeks, facts and trivia about our destination. We planned, made mental lists of things to look for, things to do. Mom always made sure we looked our best, Dad always took time to show us odd things. I know that we were poor, that my parents had to save and save for these trips and that every penny was hard earned...but oh, so worth it . Beer budget with Champagne memories! Whew! 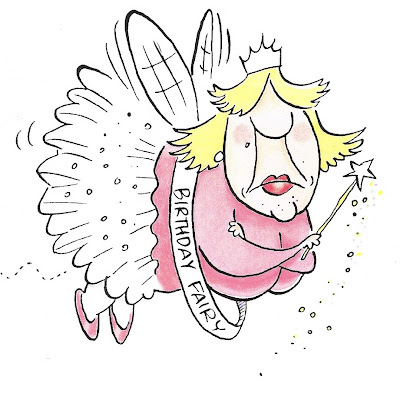 Birthdays can be stressful, especially when people want to talk about how old you are. All's well that ends well. I double talked them, danced around the answer and finally bored them until they forgot the question. I'd quit having birthdays if I didn't like presents so much and a mid-July birthday is about 1/2 way to Christmas! Yesterday Mark called to say he was bringing home a dozen ears of corn to add to our dinner. I will say it was the BEST corn on the cob we have had in years, but of course, nothing is normal in our family...including... The corn...the kid...and maybe, just maybe, the mom? Everyone is used to me saying, "Wait, I need a picture of that!" in our family. Some of them run and hide. Some, like Tony, take advantage of the situation. When I said we had a double ear of corn and to wait while I grabbed the camera, Tony graciously staged something that looks like an ad for Country Cornflakes? Bet you thought I quit knitting, didn't you? Any time you see 'dumb' socks, you should realize they are for Andy. Andy swears that these are the only sock he can wear with his work boots. He's been known to do a load of laundry if he needs hand knit socks for work the next day. Yes, he takes a lot of ribbing, but he thinks the guys have gotten used to them as long as he avoids borrowing Kailyn's pink striped ones. This is the first time ever, I used self striping yarn and did not match the stripes. It's so disturbing to my OCD eyes, that I am not sure I can leave the photo up here, let alone have the socks around the house. Both will probably disappear rather quickly. My Grandson, JR! Listen? Hear a strange noise? It's probably JR growing. If the photo looks blurry, it's because he's springing upwards! Hard to believe he's 16! Time really does fly! The sky was beautiful, even though we were being watched by our resident big bird. Not sure what it is, but once I found out it wasn't the stork looking for me, I relaxed! We invited some friends of ours to come for the afternoon. They brought their daughter and her friend. I forgot how silly girls can be...they put their life jackets on upside down and floated around! Oh...and never let your husband play with sharp knives...we interrupted our day with a quick trip to urgent care for 4 stitches! Yes, that's JR skiing on his first try...ever! and there is his grandmother, with only a point and shoot camera with no zoom! Duh??? She's getting pretty fancy, isn't she? Yesterday morning, I woke up to temps in the high 50's. Just what I had been waiting for! I made a huge pot of potato soup. Certainly, the kids smelled it...and came for dinner. After dinner, Andy, who never gets tired of playing, 'invented' his game of t-ball-golf-with a stone: And played until he finally knocked the stone off the stick: Every family has one...Andy is ours! This morning is another gloriously cool and bright mornings...feels almost like autumn. I love the cooler weather. I got up early and have brownies baking. I'm going to take lunch down to share with Andy.